Double Dare is a reality game show where teams of 2 attempt to win some cool prizes, maybe even some cash, by competing against other teams in a variety of challenges. Those challenges can be anything from trivia quizzes to some messy physical feats. The original Double Dare aired in the 80’s and was hosted by Marc Summers. The show had a few variations over the years and ended in 1993. However, Double Dare saw a reboot, or a revival, in 2000 which finished it’s short run in the fall of that year. Well, Double Dare is coming back. The show will air on Nickelodeon and seems to be headed for a summer of 2018 premiere. 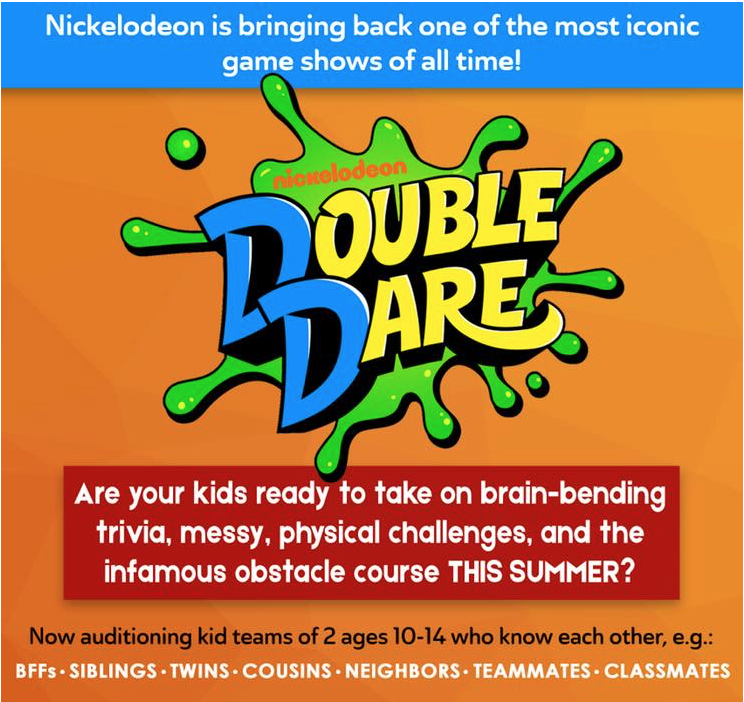 Nickelodeon’s Double Dare is now casting online and parents are able to submit their kids to the show by using the online casting forms created by the show’s casting directors. Are your kids ready to take on some brain-bending trivia. Are they up to the challenge of some messy, physical challenges. Can your kids take on any obstacle course like an old pro? If so, here is your chance to visit the show’s casting director’s sites and fill out the submission forms. The show is currently casting teams of 2 kids who are between the ages of 10 and 14. Teammates need to know each other and can be from a variety of relationships such as BFF’s, siblings, cousins, neighbors, classmates or other types of duos. You may also apply at https://www.mysticartpictures.com/mystic/castingdetail.php?nc_id=186 and more info may be found here. Hi liza and mark, I am from Beaumont. Me and my best friend have been talking about moving to L.A. where the show is produced and she is 13 and I’m 14. This our last opportunity to be on double dare for cash and prizes so really hope you have sympathy for us and invite us. Still love the show, always. I love double dare and I would really like to go! Hi my names Maya, I will be in California in August so I might be in it if it’s still going by then. So yeah! Hi my son Landen, age 11, would really love to be on double dare with his friend Andrew Gomez age 11! Hello! My name is Reagan, I live in MA and I am willing to drive down with my BFF Caitlin! So excited to see if there is a reply, and I love the show so much!